Locally the place is known as Beras Terbakar which means Field of Burnt Rice. Although there is nothing much to see there now, it has a lot of historic significance. When the battle broke out between Siam and Langkawi at Pancur Straits in 1821, at one stage the then chief of Langkawi's Army Dato Kemboja realized that soon the Siamese would capture the island. Padang Matsirat had been the main place in the island with vast stretches of paddy (rice) fields. And rice has always been the main source of supply and means of livelihood in the island. In order to prevent it from falling in the hands of enemy, the Army Chief immediately sent a messenger to Padang Matsirat and ordered the villagers in the area to collect all their paddy harvest and burn them. 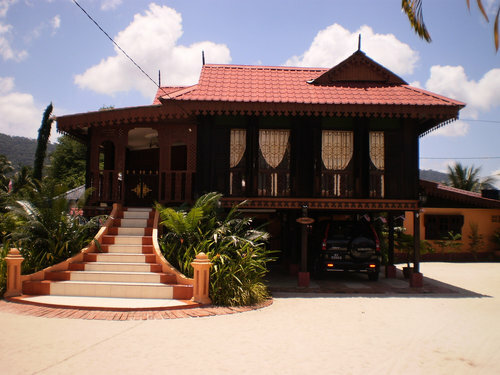 The villagers brought all their harvest to this place which is located in the house compound of Ku Halim Bin Ku Hassan in Kampung Raja who was then the king and the place was the ancient capital of the island. They dug a huge hole in a field at this place, put all the collected paddy and burnt the entire crop. This was done so that the Siamese would not get a hand on the paddy to get hold of the main supply of food, and thus fail to a put a foothold on the island. It's a different story that the strategy did not exactly work out the way it was conceived. The Siamese did capture the island and kept a strong foothold in the island despite the paddy being burnt. The legend says that all this happened due to the curse laid down by Mahsuri, the maiden lady who was falsely accused of adultery by her mother in law and was eventually executed only two years before the battle took place. She cursed the island with seven generation of misfortune which is said to have passed in 1980s. So what can you see at Field of Burnt Rice? The small field area where the hole was dug has been conserved and protected. Although you can't see the hole any longer, there is a signage there which indicates the place where the hole was dug up to burn the rice. 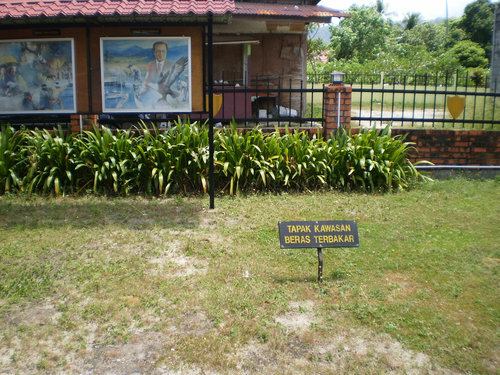 The signage says "Beras Terbakar" which means field of burnt rice. Since the time of the incident till now, there has been traces of burnt rice found in the field particularly when heavy rains brings them up to the surface. If you look further out, you can see stretches of paddy fields and cows grazing. 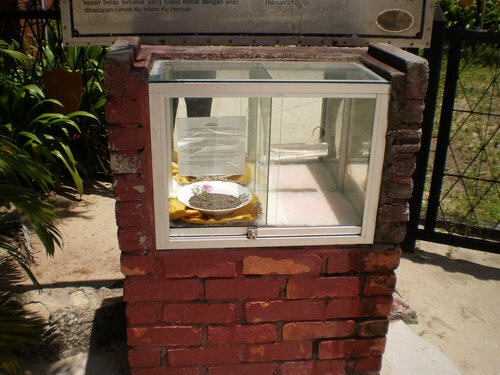 There is also a small glass case kept at the compound near the field which has some sample of the burnt rice. But you can't take them. There are no facilities here. Approach is from the large public car park area where the Padang Matsirat weekly night market is set up. You will probably spend a few minutes, take some pictures and get back. But the narrow pathway to the field of burnt rice is through a series of stalls selling all kinds of good including clothes and souvenir items. So on your way back, you can pick up a few items. They are quite cheap. Open from 9am to 6pm daily. There is no admission fee. The Field of Burnt Rice is located at the compound of the house that belongs to Ku Halim Bin Ku Hassan, at Kampung Raja, Mukim Padang Matsirat. It is about 17kms from Kuah. You will need to come to the venue of the weekly night market which held in the area and then take the approach through rows of small stalls.